On this installment of our ongoing series Good to Go which looks at the best gear for intrepid road warriors, we turn our attention to the NOIZY Kameleon Earbuds. These are fashion-forward, Bluetooth enabled Earbuds that are designed to be mobile, convenient and flexible. On paper they’re perfect for world travelers so we took 4 of our interns and for once let them do something nice; use the NOIZY Kameleon Earbuds for a week to give us their feedback. For some reason they all thought this would be more fun than getting our Editors coffee. Kids these days. The Earbuds come with pretty impressive numbers. The battery life is rated for about 4.5 to 5 hours of listening with 80 hours of standby time. We also liked the fact that there’s an auto shut off feature when the device is not connected. The Earbuds feature multipoint connectivity so that you can connect them to multiple devices and they say they have a 33 foot range. In practice our interns never tested this although one did mention that, “While I was working out I just left my phone on a bench in the locker room to avoid carrying it and the signal worked all throughout the gym.” Apparently he works out in a facility that has no crime. Kids these days. Comfort is one thing but sound is obviously another important factor. 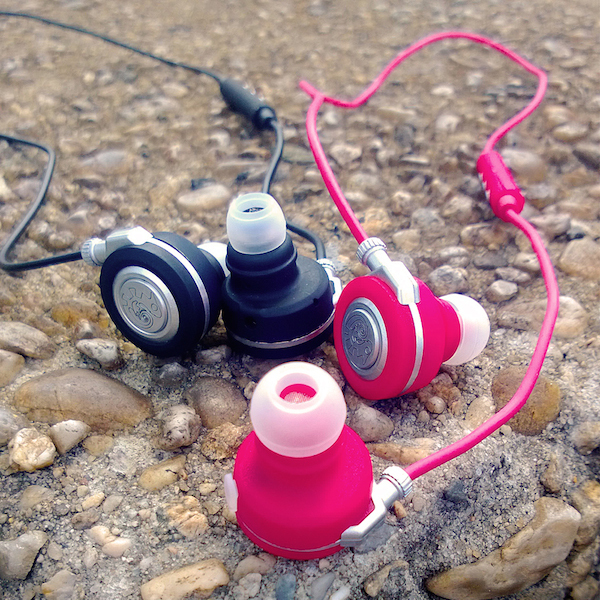 Here too the NOIZY Kameleon Earbuds impressed. “The sound was bright and airy, I felt the bass was a little better than the stock iPhone Earbuds and the volume went higher.” Another one of our reviewers had a different take though, “I thought the treble and mids were a little too pronounced but the bass was solid and didn’t distort at higher levels.” It’s cute when interns think they’re writing for a stereo magazine from the 1970’s. On the plus side the general feeling was that the Earbuds, “were easy to use, they sounded good and the Bluetooth worked great.” On the slightly negative side one person felt that, “The neck strap wasn’t long enough and so the controls were not hanging in a convenient place.” Of course he’s our 6’3” ex-football playing jock so his neck size isn’t typical. In the end we found the NOIZY Kameleon Earbuds to be a great product that delivered both good looks and good performance. If you run on the road, want the convenience of Bluetooth connectivity and a pair of Earbuds that look really good then we definitely recommend the NOIZY Kameleons. As our favorite intern said, “I’m not giving these back. I get coffee for my bosses without complaint so I’ve earned these.” Kids these days.